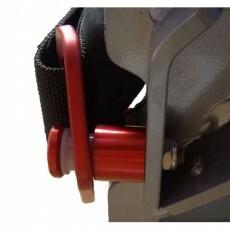 The Pro ST Seat Belt Swivels, made specifically for the standard Shock Tower made between 2004 & 2009. These model Shock Towers have a side brace on each side of the underside swingarm that the swivel set bolts to. This swivel kit includes 2x belt loops, 2x swivel mounts w/ nylon sleeve, 2x aluminum spacer, 2x 5/16" x 18 x 1.5" FHCS SS bolts & 2x 5/16" jamnuts.